Michal Rozsival and the Rangers look to make it seven straight victories over John Madden and the Devils tonight at MSG. With eight divisional matchups, Thursday’s NHL schedule is chock-full of playoff implications. After playing no games Wednesday night, there will be six Eastern Conference games Thursday, including Boston hosting Toronto, New Jersey looking to stop its four-game losing streak against the Rangers, Buffalo visiting Ottawa, the Islanders facing the Pittsburgh Penguins and the returning Sidney Crosby, Washington looking to gain playoff ground against Tampa Bay and Atlanta visiting Florida. Two late games feature Dallas playing San Jose and Phoenix taking on Los Angeles. * Toronto defenseman Pavel Kubina, who would like to meet Johnny Depp, has the eighth-most blocked shots in the League with 158; 67 more than any Maple Leaf. Four of the top 10 shot blockers in the NHL hail from the Northeast Division. * New Jersey, which has lost its last four games, has not scored an even-strength goal during that span. 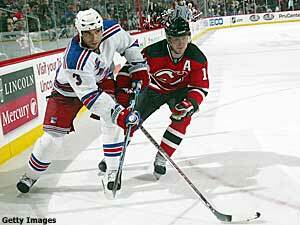 Devils left wing Zach Parise, who leads the team with 30 goals, has not scored in his past seven games. * The Bruins, who are just two points ahead of the Capitals for the eighth and final Eastern Conference playoff spot, have a 10-12-5 divisional record and play just one of their final six games against a non-divisional opponent when they visit the Devils next Wednesday. * Rangers goalie Henrik Lundqvist, who plays guitar, has two losses in regulation in his past 12 decisions and has not yielded more than three goals in any game during that span. * Buffalo right wing Maxim Afinogenov, who scored 23 goals last season, has scored in just one of his past 16 games. Afinogenov, who arguably has the best hands among the Sabres, has a minus-15 rating this season, after recording a career-high plus-19 rating last season. * Islanders right wing Kyle Okposo, selected No. 7 overall in the 2006 NHL Entry Draft, has one goal and two assists for three points in four games since being called up from the Bridgeport Sound Tigers of the AHL. Okposo, 19, had a two-point effort last Friday in which he scored the game-winning goal in the Islanders’ 3-1 defeat of the Devils. * Ottawa defenseman Anton Volchenkov, who missed 15 games with a broken finger, is second in the League with 195 blocked shots. Volchenkov, who is a stay-at-home defenseman, has the second-highest average of shorthanded ice time among Senators with an average of 4:19 per game. * Pittsburgh, which has won six of its last eight games, leads the Atlantic Division with 95 points. The Penguins, who have scored 34 goals in their last eight games, were the second team in the Eastern Conference to clinch a playoff spot Tuesday with their 2-0 victory against New Jersey. * The Capitals play just one of their final five games against a team that is currently in a playoff position. * Tampa Bay right wing Martin St. Louis, who wears No. 26 because he idolized Montreal Canadien Mats Naslund growing up, has 17 goals and 23 assists for 40 points and a plus-12 rating in 42 career games against the Capitals, including three goals and five assists for eight points in six games this season. * Atlanta goalie Kari Lehtonen, selected No. 2 overall in the 2002 NHL Entry Draft, has just one win in his last 11 decisions and has allowed less than three goals just once during that span. * Florida defenseman Jay Bouwmeester, who is tied for seventh in the League among defensemen with 13 goals, leads the team with an average of 27:33 of ice time per game – 6:06 more than any other Panther. * The Stars, who were vying for the top spot in the Western Conference, have lost their last four games and find themselves in sixth place in the conference with 89 points and are just three points ahead of the eighth-place Vancouver Canucks. The Stars, who play in the only division in the League with two teams that have accumulated 95 points so far, play the division-leading Sharks twice in their final six games of the regular season. * San Jose center Joe Thornton, who won the Hart Trophy as the player adjudged to be the most valuable to his team in 2006, has eight goals and 22 assists for 30 points in 30 career games against the Stars, including two goals and six assists for eight points in six games this season. * Phoenix right wing Shane Doan, who has three goals and six assists for nine points in his past four games, has five goals and seven assists for 12 points in seven games against the Kings this season. * Kings left wing Dustin Brown, who leads the League with 295 hits, leads American-born players with 31 goals this season.